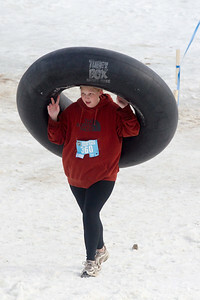 Sarah Nader- snader@shawmedia.com Alison Magoon carries her tube up the hill while competing in the Abominable Snow Race at Veteran Acres Park in Crystal Lake Saturday, January 30, 2016. The race featured 24 obstacles on the 3.5 mile course. 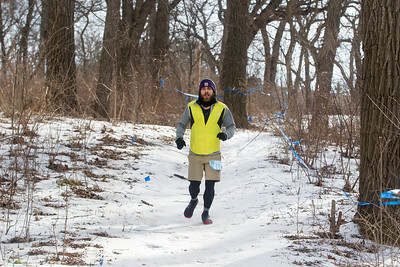 Sarah Nader- snader@shawmedia.com Jonathan Poloncsik competes in the Abominable Snow Race at Veteran Acres Park in Crystal Lake Saturday, January 30, 2016. The race featured 24 obstacles on the 3.5 mile course. 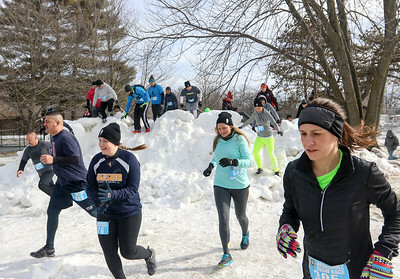 Sarah Nader- snader@shawmedia.com Runners compete in the Abominable Snow Race at Veteran Acres Park in Crystal Lake Saturday, January 30, 2016. The race featured 24 obstacles on the 3.5 mile course. Sarah Nader- snader@shawmedia.com Allison Magoon slides under an obstacle while competing in the Abominable Snow Race at Veteran Acres Park in Crystal Lake Saturday, January 30, 2016. The race featured 24 obstacles on the 3.5 mile course. Sarah Nader- snader@shawmedia.com Allison Woodin climbs over an obstacle while competing in the Abominable Snow Race at Veteran Acres Park in Crystal Lake Saturday, January 30, 2016. The race featured 24 obstacles on the 3.5 mile course. 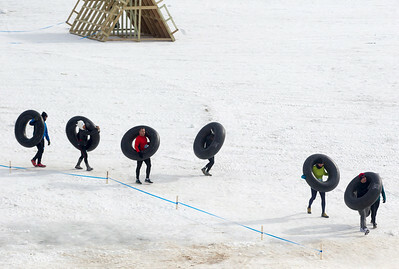 Sarah Nader- snader@shawmedia.com Jenn Loiacano (center) climbs over an obstacle while competing in the Abominable Snow Race at Veteran Acres Park in Crystal Lake Saturday, January 30, 2016. The race featured 24 obstacles on the 3.5 mile course. 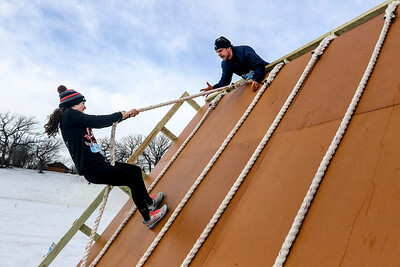 Sarah Nader- snader@shawmedia.com Molly Gniady (left) gets help from Joe Gniady while climbing over an obstacle while competing in the Abominable Snow Race at Veteran Acres Park in Crystal Lake Saturday, January 30, 2016. The race featured 24 obstacles on the 3.5 mile course. Sarah Nader- snader@shawmedia.com Sylvia Lima crawls under an obstacle while competing in the Abominable Snow Race at Veteran Acres Park in Crystal Lake Saturday, January 30, 2016. The race featured 24 obstacles on the 3.5 mile course. 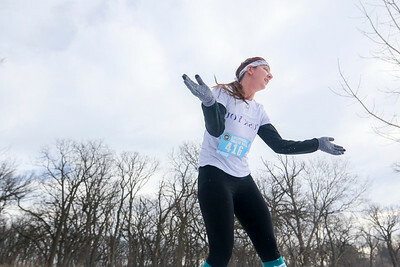 Sarah Nader- snader@shawmedia.com Bonnie De Anda cheers on runners while competing in the Abominable Snow Race at Veteran Acres Park in Crystal Lake Saturday, January 30, 2016. The race featured 24 obstacles on the 3.5 mile course. 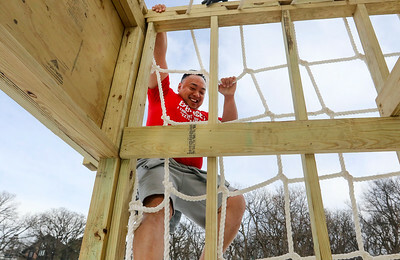 Sarah Nader- snader@shawmedia.com Melvin Wong climbs over an obstacle while competing in the Abominable Snow Race at Veteran Acres Park in Crystal Lake Saturday, January 30, 2016. The race featured 24 obstacles on the 3.5 mile course. Sarah Nader- snader@shawmedia.com Richard Evonitz climbs over an obstacle while competing in the Abominable Snow Race at Veteran Acres Park in Crystal Lake Saturday, January 30, 2016. The race featured 24 obstacles on the 3.5 mile course. 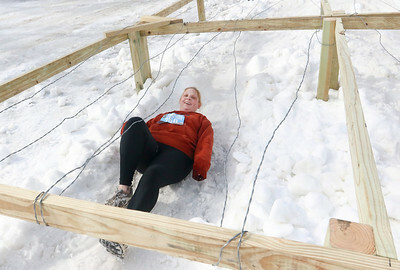 Allison Woodin climbs over an obstacle while competing in the Abominable Snow Race at Veteran Acres Park in Crystal Lake Saturday, January 30, 2016. 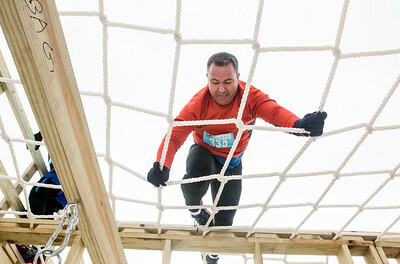 The race featured 24 obstacles on the 3.5 mile course.